Even in his prime Dev Anand had something of a creepy dirty old man about him, and his films tend toward the preachy side. But somehow I like them anyway. They are well-crafted and interesting, and always feature delectable heroines and terrific song and dance. Jewel Thief in particular is a delicious confection from beginning to end; Hare rama hare krishna, while more serious and less perfectly wrought, also has its strengths. Guide is still weightier fare, but it delivers its heavy-handed spiritual message with a beautiful sense of style. Raja (Dev Anand), freshly released from prison, decides to get a fresh start in a distant city. On the way, he takes a nap in a temple; the villagers mistake him for a wandering holy man, and he goes along with the error, enjoying the free food and free shelter. A flashback that lasts most of the film's length provides Raja's backstory. He started out as a tour guide in a small town. A visiting archaeologist and his wife Rosie (Waheeda Rehman) engage his services, and as he gets to know them he learns that their marriage is troubled. Rosie only wants to dance, an activity that her husband forbids. When the marriage finally implodes, Raja helps Rosie pursue her dream - falling in love with her in the process - and before long she is a world famous dancer. Eventually things turn sour for Raja and Rosie as well, and a distance grows between them; a series of poor choices by both of them leads to their separation and Raja's incarceration. Back in the story's present, Raja is drawn deeper into the spiritual needs of the villagers who have anointed him their swami. Ultimately, Raja must make a decision: withdraw from the con-game that made him the villager's spiritual leader, or face his own spiritual journey head-on. Raja's spiritual journey is moving, but it is also a peculiar bookend to the meat of the story: his relationship with Rosie, and Rosie's confusion about what she wants from her life. There were no delicate parallels to be found between Rosie's arc and Raja's; the two stories are connected because Raja is involved in both of them, but it seems that Raja could have had any number of troubled relationships and still ended up in the same place. Still, while it isn't the most cohesive film ever, Guide is gripping, not least because of the dramatic, alluring intensity of Waheeda Rehman. She is stunningly beautiful, and she offers a performance of tightly wound, dark intensity punctuated by eye-popping, brilliant dance. 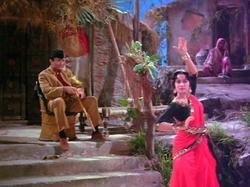 In her first number of the film, the famous "snake dance," she cuts loose with an intensity that palpably conveys the passion that Rosie's disapproving husband has forced her to suppress. And the profound, emotional S.D. Burman soundtrack gives her many more moments to shine: "Piya tose" tracks Rosie's meteoric rise from village entertainer to international superstar; within the course of the song she dances in ever larger production numbers on ever larger stages. And in "Mose chal," Rosie dances out her anger at Raja when she thinks he has cheated and betrayed her. All in all, Guide is an effective film, quite different from your stereotypical Bollywood love story, and quite sensitive, if somewhat preachy, in both its portrayal of the earthly concerns of a sad divorced woman and its ultimate discourse in Vedic philosophy and spirituality.